Dr George Hines, who died on the 15th October, 2018, at the age of 82 in hospital in Cheltenham, near his home at Stroud in SW England's Cotswold Hills, spent his entire career in Britain's civil nuclear electricity-generating industry. It was almost an afterthought by his first employer, the Central Electricity Generating Board (CEGB) that saw George dispatched as part of a small team overseeing the connection of the generating sets of Dounreay's Fast Reactor, housed within its famous spherical 'dome', to supply the country's National Grid in 1962. This livewire link was hailed as a 'World first', a notable feat for the British team of scientists, engineers and construction staff that had designed, built and were now commissioning the country's first 'fast reactor': a type of advanced, but complex, experimental plant that was regarded then as the long-term route for delivering power on a large scale to the country's factories, offices and households. George, a bright working-class boy, one of a family of five to Alfred and Alice Hines, of Paddington, in London, passed his '11-plus' exams, winning a prestige place at the Quintin Grammar School in Regent Street, in the heart of London's West End. Continuing his studies at the Sir John Cass College of Arts and Sciences, he emerged with a good first degree in metallurgy and was then offered the chance to continue to advanced PhD level at London, now into aspects of nuclear physics. Dr Hines was offered his first working post as a management trainee with the Central Electricity Generating Board (CEGB) at the 'new' Berkeley atomic power-station, the earliest of three first-generation 'Magnox' plants situated in the lower valley of the River Severn. There was only one snag; Berkeley's construction phase was not yet completed, so the station was not quite ready for an operational start for George. So, CEGB bosses asked if he would go to Scotland's 'remote' North coast, on a short-term assignment to commission the World's first soon-to-be operational 'fast breeder reactor' at Dounreay? Yes, he would, and that was a decision that would change his personal life and will shortly see his ashes being placed in the kirk-yard surrounding the medieval-origin Canisbay Church in Caithness, close by the tide-swept waters of the Pentland Firth. The 'demonstration' 15 MW Dounreay Fast Reactor was excitingly innovative, as it was seen as the precursor to a series of power-stations developed from its ground-breaking blueprints. Those 'plants of the future' would be able to 'breed' as much nuclear material as they consumed. This was firstly via a 'mysterious' radioactive metals 'transmutation' process in the heart of the reactor whereby almost all of the uranium was transformed into plutonium by irradiation, then by the chemical 'reprocessing' of the 'used ' fuel-rods and finally fabricating the most of the resultant material into fresh 'fuel elements', ready to be re-inserted back into the reactor's 'core'. Those 'plutonium-fired' stations would follow on from 'first-generation' uranium-burning 'thermal' plants, such as Berkeley, Chapelcross and the earliest Hunterston atomic facility. A short spell at Dounreay would be useful for any aspiring nuclear specialist to have on the CV, with future prospects in mind. But what would the 'social' side of life be like up there, the young Londoner pondered? He needn't have worried because two brothers Dave and Bill Fehilly, having moved up to work in the early days of Dounreay's construction as industrial painters, had spotted a business opportunity for modern entertainment, with hundreds of Britain's brightest young brains descending on Scotland's Far North to become the human ingredients of the Dounreay 'dream'. That vision appeared over when the UK Government pulled the plug on funding active research there in the late 1980s. But George lived long enough to see it resurrected in a major way, with Windows 'software' multi-billionaire Bill Gates's TerraPower company in the US collaborating from 2015 with China's main state-owned top nuclear firm to build a new sodium-cooled fast reactor prototype 'by 2030'. The super-rich self-made American reckons that such 'tweaked' plants, in which he is investing huge private sums into, can be used to safely deliver affordable 'low-carbon' green electricity to billions of the world's poorest people by the end of the 21st century, if not before then. As Glasgow Dance Promotions, the Fehillys brothers began to attract 'hit-parade' bands to Caithness, from their home-city's Alex Harvey to America's rock 'n' roller Gene Vincent to play in Wick's big wooden BB Hall, where up to 1,000 young folk could meet, socialise and be entertained. It was there that George met a pretty young crofter's daughter Sally Rosie, who had returned home from a 'civil service' training college in Edinburgh to work in the Caithness County Council's education service administration. 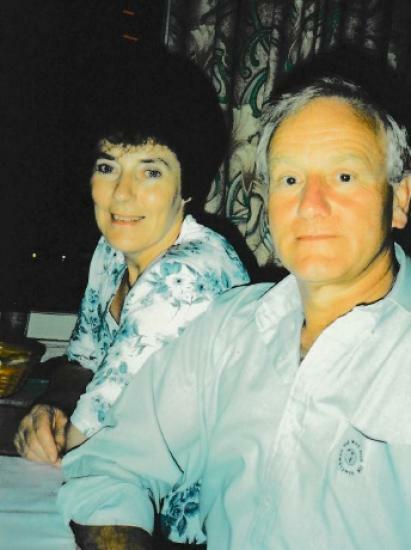 Sally, whose John O'Groats family were said to descended from an ancestor who had crossed to the Mainland from the now-uninhabited mid-Pentland Firth isle of Swona, Orkney, became his lifetime's soul-mate from their marriage in 1962 to her death in 2007. The young couple moved to Berkeley, where George resumed the CEGB career, the one that had originally initially intended for him. In 1976 he moved with the family to Dorchester, in Dorset, where the workings of two more prototypes of 'thermal' reactor systems ... one British and the other a European collaboration ... were being studied in detail at the UK Atomic Energy Authority's Winfrith complex. Then in 1985 it was back to Berkeley for the Hines family, purchasing a home in Stroud, the pretty Cotswolds town. By the late 1980s, Berkeley had exceeded its anticipated 25-year lifespan with the cessation of electricity-generating there in 1989. But that did not mean a career-end for George, for highly-qualified staff with day-to-day familiarity with safely running the power-station remained in demand for managing the decommissioning of its complex systems. Dr Hines retired in 1994 as manager of Berkeley's Engineering Services Operations. George, Sally and their growing young family felt a strong bond to Scotland's Far North. In 1998, they decided to build a new cottage in a corner of his wife's family croft-land, so that they could travel back and forth at leisure. They spent many happy weeks and months together there until Sally's ill-health intervened. George, who had been treated for cancer over the past couple of years and appeared to be 'on the mend', died of a pneumonia infection. His body was cremated at Cheltenham on November 1st, 2018, and his ashes are soon to be placed next to his wife's at Canisbay, Caithness.